Bottom Layer: Place the grated tapioca in a large sieve and press with a sturdy rubber spatula. Discard the tapioca juice and retained the starch. Combine the water, palm sugar, cane sugar and bring it to simmer until all the sugar has dissolves and let it cool slightly. Mix in the grated tapioca, sea salt, and the reserved starch. Stir until well combine. Place the tapioca mixture in a square or round pan, and steamed for about 20 to 25minutes over rapid boiling water. Top Layer: Mix the coconut milk, water, Hoon Kue/green pea flour, and sea salt until smooth. Strain the mixture into a saucepan. Stir and cook until the mixture starts to thicken. Remove from the heat and mix until smooth you have a smooth batter. When the bottom tapioca layer is cooked, blot off excess moisture with a paper toerl. Then pour the coconut mixture on top of the tapioca and steam the kuih over high heat for another 15 minutes. Remove and let cool completely before serving. 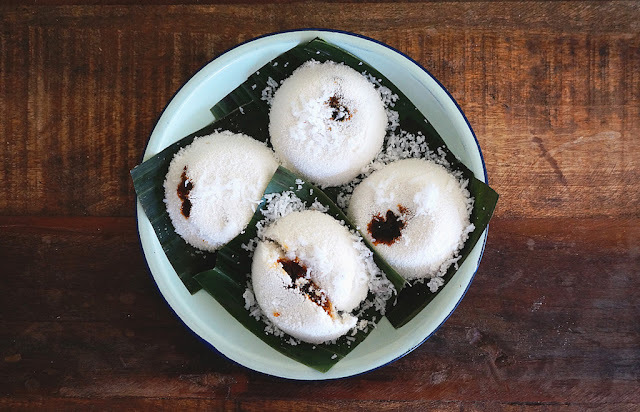 The tapioca kuih can be slice into any shape of your choice.